Homemade Sloppy Joes Recipe - Better and Healthier Than Store Bought! Have you ever looked at the ingredient list on the can of Sloppy Joes sauce? 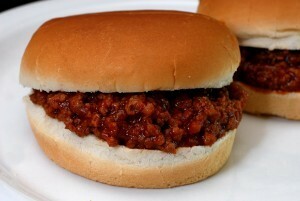 Homemade sloppy joes – simple and easy to make. If you haven’t, the most likely first ingredient will be High Fructose Corn Syrup (HFCS). Don’t stop reading there, you may also find regular corn syrup, white sugar, or brown sugar listed as well. 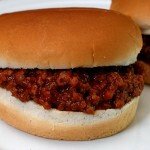 I grew up eating homemade sloppy joes, so when I first tried sloppy joes made with a store-bought sauce at a friend’s house, I was shocked at how sweet the mixture tasted. My friend had always made sloppy joes this way, never even trying to make her own sauce. She challenged me to making sloppy joes taste just like hers without the HFCS. So after adapting our standard recipe to be a little sweeter the taste test was on! Needless to say, she was convinced that my recipe was made with canned sauce. She now makes large batches of homemade sloppy joes and freezes them for a quick meal whenever needed. Mission accomplished! 1. Brown ground beef in a skillet, then drain off any fat. 2. Add remaining ingredients to the skillet and bring to a boil. Reduce heat and simmer for 10 minutes, stirring occasionally. Brown ground beef in a skillet, then drain off any fat. Add remaining ingredients to the skillet and bring to a boil. Reduce heat and simmer for 10 minutes, stirring occasionally. ← Fertilizing Vegetable Gardens Organically – When, How And What To Use! I am glad to see that other people are interested in getting the High Fructose Corn Syrup, Corn Syrup and as much other sugar and sweeteners out of their diets as we are. HOWEVER, be careful when using ketchup and other pre-prepared items, because many of them have the same ingredients. Frenches has a ketchup that has no HFCS. It takes a special talent to taste a food and figure out what it takes to make at home from scratch! I make it pretty much the same way but leave out the tomato sauce. I add just a smidgen of brown sugar and a dash of worchestershire sauce. My family loves it! Now you have to check your ketchup brand also for HFCS. Buy natural or organic to avoid this.